MOSCOW, December 6. /TASS/. The Venezuelan Armed Forces are interested in the modernization of ground and air systems previously supplied by Russia, Defense Minister Vladimir Padrino Lopez said during talks his Russian counterpart Sergei Shoigu in Moscow on Thursday. "Yesterday, when our presidents had talks, many issues in the military area had emerged, particularly those related to stepping up cooperation in the maintenance of the equipment supplied from Russia to our country. These are land-based and air systems. And we came to the conclusion that we need to modernize and upgrade the existing systems," he stated. The Venezuelan defense chief noted that he came to Russia as part of the delegation led by President Nicolas Maduro, while the meeting with his Russian counterpart was not initially planned. "Our meeting was not scheduled, but the questions arose during negotiations between our presidents," he added, pointing out that relations between both countries "need to be beefed up to become more efficient." Shoigu in turn said that he hopes that the practice of flights by Russian combat aircraft to airdromes in Venezuela will go on and Russian naval ships will continue to pull into that country’s ports. "Our cooperation proceeds in a good fashion. There have been regular exchanges of specialists and delegations. Good work is underway in training and in granting our aircraft an opportunity to make landings in Venezuela and our ships, to be serviced in Venezuela’s ports. I believe that we will go ahead with this practice. 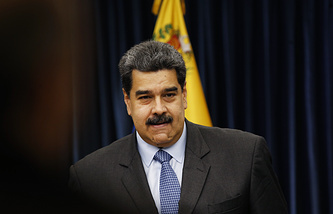 The more so, since it is to the benefit of Venezuela and Russia," he emphasized.